Is there anything better than waking up to fresh-baked bread? Our Wholemeal Bagels are a real crowd-pleaser, and a wonderful addition to any weekend brunch. This recipe is for confident bakers, made with Allinson wholemeal dough. Fans of New York baking classics can also try our Pretzels recipe. RISE Lightly grease the mixing bowl with some oil. Put the dough back in, cover the bowl with a clean tea towel and leave to rise until doubled in size – about 2 hours depending on how warm your kitchen is. 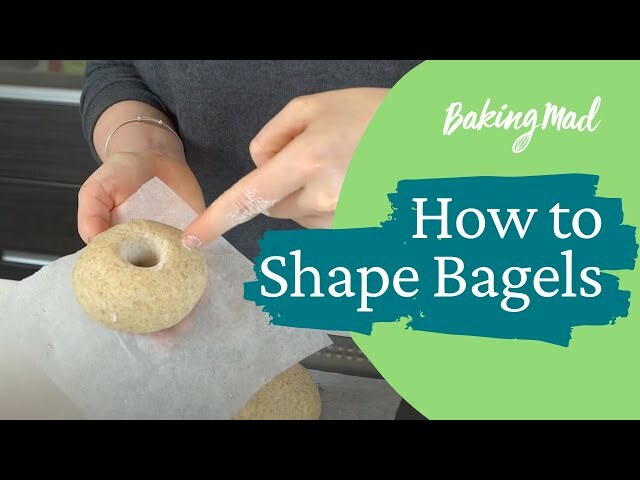 SHAPE Knock back the dough by gently kneading just 5 times to get the air out. Line two baking sheets with baking parchment and grease the parchment. Cut the dough into 9 even pieces (use a weighing scales if you like). Roll each piece into a ball and sit on the sheets – they’ll need room between them for growing. PROVE Cover the dough again with a clean tea towel and leave to prove until doubled in size again. Preheat your oven to 220°C (200°C fan, gas mark 7) and fill a large saucepan with water. POACH Bring the pan to the boil, then lower the heat to gently simmering and stir in the bicarbonate of soda, honey and 1 tsp salt (careful – it will bubble up!). Use a floured finger to push a hole through the centre of each dough ball and pick it up. Stretch the hole by gently swirling the bagel around on your finger a little, then drop into the pan. Do 2 bagels at a time, poaching for 2 minutes and turning over halfway. Use a slotted spoon to return the bagels to the baking trays. Poach all the bagels, keeping the water at a gentle simmer. BAKE Brush the bagels with beaten egg and sprinkle with some seeds. Bake for 15 minutes until brown and crisp. Cool, then enjoy toasted.